Farmer Stefan here. By now, I imagine that everyone has heard that I’m departing the farm this winter. John will be carrying the farm into the next season and beyond as the sole manager. 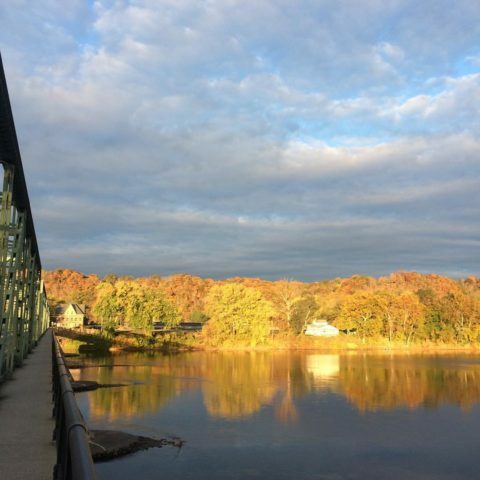 After five seasons of vegetable glory with Tinicum CSA, I am starting a new chapter of life, which involves moving back to a Zen Buddhist monastery in the Catskills. 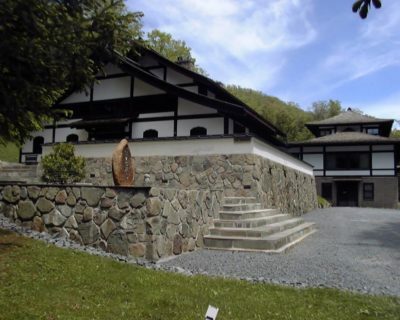 Specifically, the monastery is called Dai Bosatsu Zendo. I lived there for about three years prior to getting into vegetable growing, and I was ordained there as a Zen cleric in 2008. (That’s me in Zen mode over on the right.) I’m planning to spend 2018 up there while my wife finishes nursing school at Moravian … after which, we might both live up on the monastery’s property. What follows are some parting thoughts from me to our members and well-wishers. 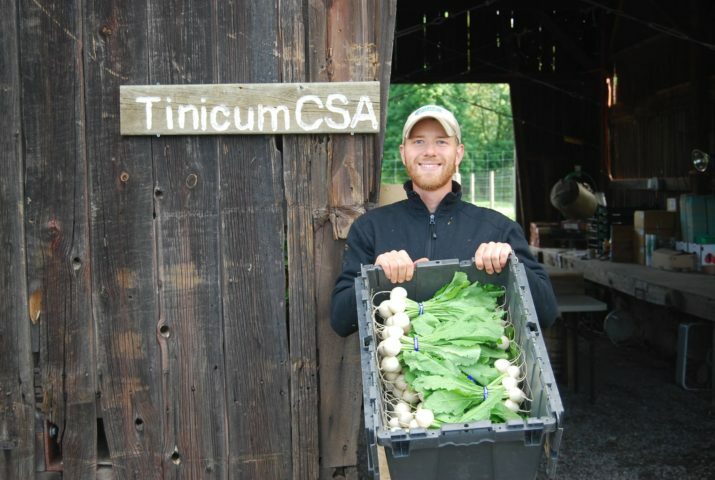 What do I make of this five-year adventure at Tinicum CSA? It’s been quite satisfying to produce something so tangible, wholesome, & high-quality. This type of farming is very fulfilling in that respect. As I said on our most recent radio appearance on WDVR’s Into the Garden, our total harvest weight for this year was just over 50,000 lbs. If you figure that we were roughly two-and-a-half full-time growers this year with John, Becca, and myself, you can divide that out to calculate that each of us accounted for about 20,000 lbs of harvest over the season. I like that. If someone wants to know “what I have to show for myself” for 2017 … well, I grew these 10 tons of vegetables. Maybe it’s not so much, but it’s concrete, and it’s wholesome, and I find it satisfying. I have greatly appreciated getting to be part of such a pleasant community of vegetable-enthusiasts. I love seeing all the ultra-cute things that kids do at our pick-ups. (One instance that comes to mind: Earlier this year, my parents visited a pick-up, and my dad took it upon himself to baby-sit the young son of one of our members while she cut flowers. I was out mowing cover crop on a tractor, and I remember my dad holding this young boy and waving to me each time I looped back across the field.) I also enjoy listening to people who are otherwise strangers to each other getting acquainted by talking about ways to cook sunchokes. I still believe in what the farm is about and what the farm does. When we started the farm five years ago, it was important to me to write out a sort of Tinicum CSA mission statement. The four planks that we settled on have been posted here on our website (in the fourth paragraph) ever since. Perhaps that’s a little silly. I expect a lot of people would’ve been content to run a farm without a “mission statement,” but I did believe strongly in the importance of being clear with ourselves about what principles governed our labors … and I still believe strongly in the four principles that we articulated. I still believe that the world needs to seriously rethink its dependence on industrial, mono-culture food production. What’s life like at the monastery? / Why did I choose to go back? Life at the monastery includes large doses of: sitting meditation, chanting, bowing, silent & formal meals, and simple labor such as cleaning & cooking. It’s a disciplined community life designed to help a practitioner strengthen their concentration and accurately observe the functioning (and the disfunction) of their own mind. I chose to go back mainly for two closely-related reasons. One is that I recognize the improvement in my life that has come as a result of my previous training there. I’m happier, more peaceful, and more effective because of my experience with Zen practice. 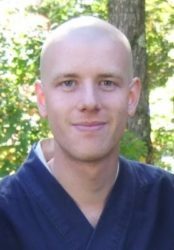 The second reason is that I know I would like to be able to spend (at least) the next chunk of my life as a Zen “minister.” I mean: Recognizing that Buddhist practice has helped me to be more contented and less problematic for myself and others, I would like to make myself available to facilitate other people’s engagement with Zen. For folks who hear something about Buddhism and decide they’d like to give it a try, I’d like to be able to offer a responsible introduction to Buddhist practice and teaching. …and it looks like returning to Dai Bosatsu Zendo at this time is a good step in that direction. Thanks for your support & for joining us in the veggie-centric experiment these past five years. Thank you for sharing your enthusiasm with us — you make our work feel worthwhile. Thanks for believing in what we do — whether you signed up because of the healthy-eating angle or because you wanted to actually know where some of your food comes from or because you believe in supporting a local economy or because you believe in rebuilding direct human relationships between people as an antidote to the toxicity and corporate control that dominates entirely too much of life in the U.S. these days … or all of the above or none of the above. Thank you for doing your part to make these past five years possible. I’m also hoping that you enjoy Tinicum CSA’s 2018 season with Farmer John and his crew.